Can Iron Entry Doors Save Energy? Property owners across the country are investing the in the durability and security of wrought iron entry doors. There is no doubt that these iron entry doors add security and style to a home or business, but can iron entry doors save energy? With the price of electricity and gas always on the rise smart property owners are considering the impact of all elements of their structure and how they affect energy efficiency. So let’s examine if your iron entry doors will help you save energy. Every area of the world fluctuates in temperature. The natural tendency of structures is to match these lows and highs. While air conditioning and heating compensate for the warmer and cooler months, they consume a lot of energy to keep us comfortable. We all know that the role of insulation is to minimize outside temperatures from affecting the interior of our homes. To that end iron entry doors can be outfitted with insulation to act as an energy saving barrier. The vast majority of iron entry doors are fabricated with large windows. This allows great views and loads of natural light into the property. Older types of glass weren’t very energy friendly and were a serious weak point in home’s energy efficiency. Today’s best iron entry doors are fitted with insulated glass. This thicker glass is engineered to be an effective barrier to the heat or cold which is trying to get into your home. Custom iron entry doors can also be designed with dual paned glass sections which offer the ultimate in energy efficiency. We’ve all seen gaps under doors and have felt drafts coming through them. The US Dept of Energy estimates that the average American home loses about 30% of its energy through these gaps. The best iron entry doors are those that have tight weatherstripping around the windows and the door itself. Quality weatherstripping installed by a professional will ensure that there isn’t a place for water or air to leak into your home. This is the only way to ensure that you’ve got the highest quality iron entry doors on the market. If you want to have iron entry doors installed but want to ensure that you’ve got the most energy efficient door possible, the best way to get it done is to order a custom iron entry door. When a door is designed especially for your property it will be the exact size you need and every element fitted to work with each other. You’ll be able to decide which glass is used, what insulation is used, and with custom door fabrication comes fine craftsmanship. In addition you’ll be able to infuse the design with your own style and design elements. 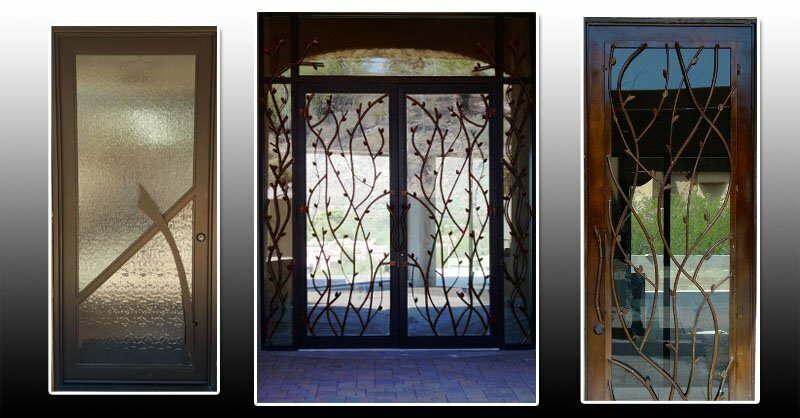 From geometric patterns to organic elements you’ll be able to have your iron entry doors completely custom to your home, your business, or whatever property you need to secure and add style.